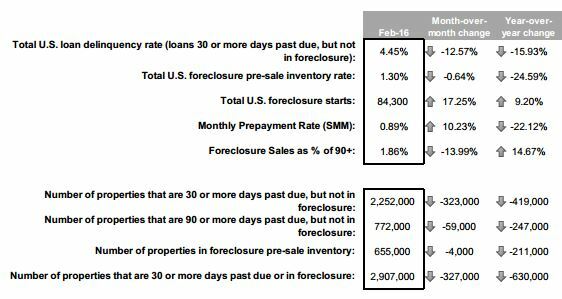 Just one month after experiencing a substantial spike, the number of 30-day delinquencies normalized in February, according to Black Knight's "First Look" at Mortgage Data for February 2016 released Wednesday. 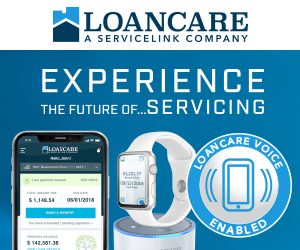 Delinquencies, defined as mortgage loans 30 days or more overdue but not in foreclosure, fell by 13 percent over-the-month and by 16 percent over-the-year in February as the nationwide delinquency rate (4.45 percent) fell to its lowest level since April 2007. This decline came just one month after delinquencies rose by 6.6 over-the-month in January up to 5.09 percent, the first time the delinquency rate has been over 5 percent in 11 months. That increase represented about 167,000 properties. February's over-the-month decline represented about 323,000 properties, down to approximately 2.25 million. Why did delinquencies reverse their field in February after hitting an 11-month high in January? The number of properties in pre-sale foreclosure inventory declined by nearly 25 percent over-the-year in February, down to 655,000. The total non-current inventory (all mortgages 30 days or more overdue, including those in foreclosure) fell by about 327,000 over-the-year down to 2.9 million—the first time in more than eight years it has been below 3 million. Only two states, California and North Dakota, have seen their non-current inventories increase over the past six months. Foreclosure starts were another story, however. The number of foreclosures started in February totaled 84,300, which was a 17 percent increase from January and a 9 percent increase over-the-year. The monthly increase was driven by a large number of repeat foreclosures in New York, New Jersey, and Massachusetts, according to Black Knight. Click here to view the entire First Look at Mortgage Data for February 2016. Previous: Is Regulation Hurting the Affordability of Housing?